Street parking available as well. Menu options: The Full Rodizio** - Enjoy a succulent variety of rotisserie grilled meats, glazed pineapple, a gourmet salad bar, authentic Brazilian sides, and an experience like nowhere else; Unlimited Salad Bar – Including Rodizio Brazilian sides. As a result of the slow roasting and seasoning process, our rotisserie grilled meats melt in your mouth, satisfying even the most discriminating taste buds. Let us know if you prefer Medium Rare, Medium or Well Done. We cut thin for tenderness and flavor. It's the Brazilian way! Proud to offer 100% MSG Free, 100% Peanut Free, and 100% Gluten Free Grilled Items. Top Sirloin: A lean, juicy cut of beef with a mild and sophisticated flavor. Tender steak basted in garlic seasonings. 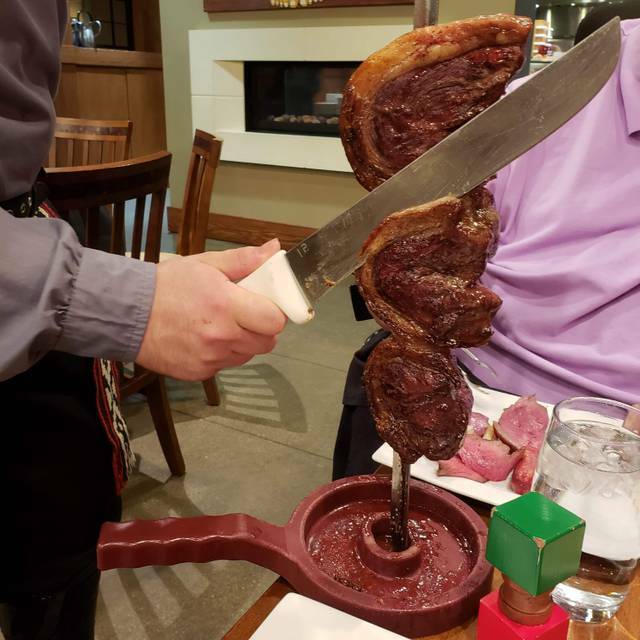 Several meats and other local selections are served as Rodizio Grill Chef's Special items and are not available at all locations at all times. Please contact your local Rodizio Grill for current Chef's Specials. A very mild and flavorful Brazilian sausage. A tender cut of pork, served with parmesan cheese and Applewood-smoked bacon. A lean cut of Ham grilled to perfection. Tender, juicy chicken breast wrapped in bacon. Sweet and spicy chicken basted in our signature sauce. Marinated & Seasoned Chicken – a special Rodizio recipe. Boneless leg of Lamb. Available at select locations. Ask your server for our daily fish selection. Available at select locations. Fresh glazed and grilled pineapple – a guest favorite. Grilled Vegetables with Parmesan Cheese. Available at select locations at our hot salad bar. Traditional Brazilian Black Bean Stew, eaten with rice & farofa. A Brazilian favorite. Yucca Flour, usually sprinkled on your rice and beans. A must try. Sautéed Collard Greens and Bacon, a traditional side to Brazilian Feijoada. Marinated Brazilian Brisket – Served with potatoes, carrots, celery and onions. Salad bar items will vary depending on season, availability and store location. Our freshly made Brazilian Sides are included with your meal and are served in abundance. Cinnamon-glazed bananas. Gluten free at select locations. Brazilian Cheese bread made with yucca flour and cheese. Rodizio Grill offers a variety of homemade and authentic desserts, which are prepared daily at each of our locations. It's the Brazilian Way. A luxurious slice of decadent chocolate mousse torte, made with a blend of four types of chocolate, served a la mode with sliced bananas and fresh whipped cream. A delicious, creamy Brazilian Caramel Flan. Gluten free when ordered without crispy wafer. A warm cinnamon pastry with a creamy center, served with vanilla ice cream and laced with caramel sauce. A Rodizio Twist – A silky and delicious crème brulee, infused with a hint of orange. This creamy favorite is a perfect end to a perfect meal. For a Brazilian twist, try it with luscious Brazilian Guava sauce – or with traditional Raspberry Sauce. ^Available at dinner. ^^Available at lunch. **Consumer Advisory: Thoroughly cooking foods of animal origin such as beef, eggs, fish, lamb, pork, poultry, or shellfish reduces the risk of foodborne illness. Consult your physician or public health official for further information. Our first server was wonderful, I believe her name was CeCe, but her shift ended and we were transitioned to Madison and she was not as friendly or attentive. It was not busy at all when we went and I one point we even had to track her down to get something. Our server seemed pretty unavailable to us and seemed like we were just something else she had to do. It took forever to get the check and to get the card back after the check. Food was good, but it seemed like we were getting the smallest pieces of meat every time they came around and to ask for a bigger piece or another piece, it almost seemed like we were taking it off their own plates. It wasn’t the first time we have been there, but this experience will definitely be considered in the future when choosing dining experiences in that area. 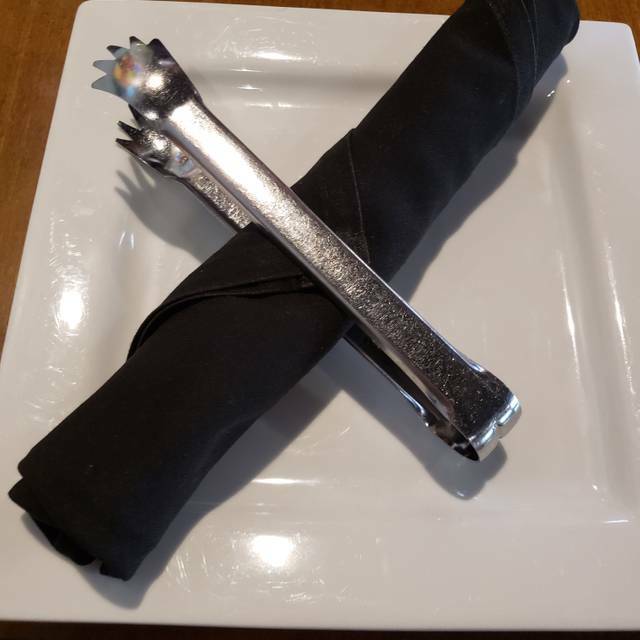 Rodizio is one of my favorite places to dine on special occasions! The food at Rodizio Grill is always top notch. The staff is great and the ambiance is excellent. This was our first experience like this. The staff was super friendly and interacted with our girls and got them to try things we thought they never would! It was a last minute decision to go, but we would definitely go back when we are in Columbus. Wait staff was very attentive and. Irdial. Food quality was excellent and anazingly diverse. Would highly recommend it to anyone seeking an international cuisine experience. Rodizio grill...was wonderful the salad bar was great and the food was seasoned well( I only eat chicken and fish) however...I was disappointed with chicken hearts which was o e of the reasons I came...they where awful...the chicken hearts need to be cooked whole not cut in slices.. Kudos to the manager who was out on the dinning floor making sure everyone was enjoying their meal...I will be back. The pork that we got was so raw it was purple and I couldn’t eat it. One of the steak’s was also massively over salted. Our waitress also, once we didn’t order drinks, pretty much never came back even though she checked on tables around us 4 times minimum. That all being said the salad bar was good, the pineapple, ham and a different pork dish were delicious and the guys who cut the meats were great and super friendly. I think it’s a bit pricey just because with the inconsistency in how stuff comes you don’t get much before you are so full you can’t move, but it’s good. Great place to eat check it out you will not leave hungry! The manager is outstanding, as well as most of the staff. They sang happy birthday to my boyfriend for his birthday (being so upscale I didn’t expect it). The only bad service I received was from the server, maybe she was new or having an off day? She wasn’t very welcoming and made it seem as though we were a burden, not to mention she had other servers bring over our drinks? The people who brought out the main dishes however were outstanding, kind, friendly and most of them had a nice short conversation with us. We will definitely be back, and I’d definitely recommend to a friend or family. Thanks for making my boyfriends 25th special! Fun dining experience! Food and service were excellent. Enjoyed the selection of sides and salad bar. Plenty to eat, meats were hot and tasty. Shrimp or more seafood would have been nice. some of the outer slices of beef were super salty tho. Would go again. Terrific service and atmosphere; I highly recommend! They got the message for the table and the roses just right. Thank you for the extra energy spent to make this night memorable. The buffet was empty on the popular items most of the evening. The server was good at explaining everything but slow on getting what we asked for. The meats tasted alike. We thought for our first anniversary we would try something different and we both said that we should have just gone to Texas Roadhouse, the food would have been better and saved some money. 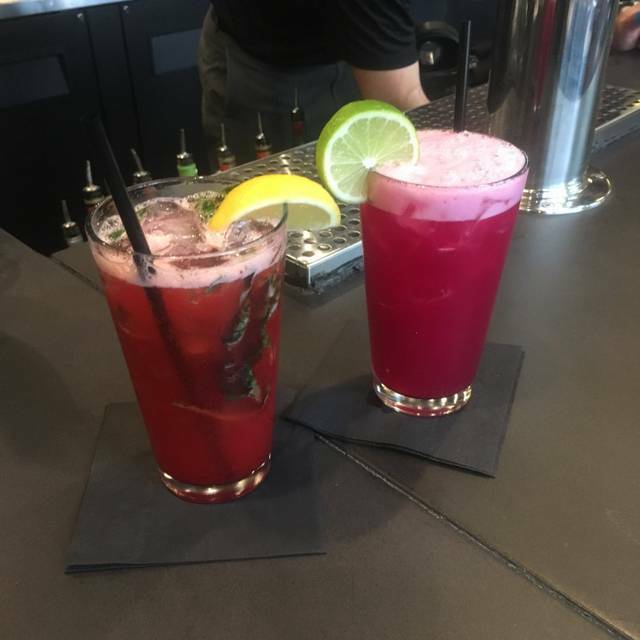 Everything about the experience at Rodizio was wonderful. We came with a part of nine for a combined birthday of my mother and mother in law, and had an absolutely wonderful time. The food was delicious and it was rare we waited long for the next offering. All of the staff were courteous, especially with three service dogs in attendance at out table. It can be a loud, high energy environment if there are a lot of birthdays and such going on, so be aware this isn't the place for a quiet sit down dinner. If you get any specialty drinks, get the house limeaid! We will be returning in the future. Good food selection, great service, friendly staff. Great restaurant, great ambiance and excellent for birthdays. Great food and a friendly staff. Also a great dining atmosphere. The food was fantastic. 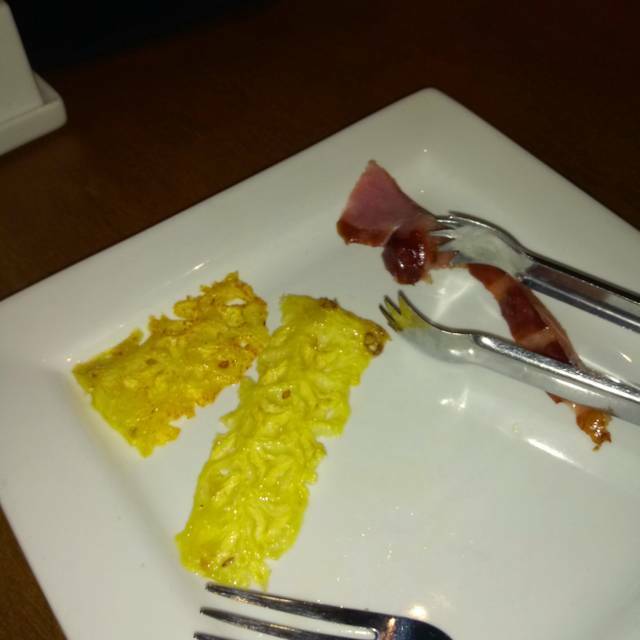 Though with the awkwardness of the serving style, the service felt a little hit or miss. It is certainly a place where if you want to take a long time and relax and eat, a lot. Unfortunately when we were ready for our check it took longer to find our server and get our checks processed than I would have liked. But with that in mind, it will easy to be able to adjust for my next visit. This was our first time and let me tell you we had a great time. The food, service and manager were fantastic. We were greated as soon as we entered the door and kept abreast of our wait time.....Great! Great food at an affordable price..Manager was amazing and very friendly. You could tell he led by example awesome experience. It was a wonderful experience! It’s rare to go to any restaurant and have every single staff member smiling, making you feel welcomed into their establishment. Great food, great staff, great atmosphere! Fun experience. Great food, great service, great ambiance. It is a bit pricey, but well worth it in my opinion. I'll be back. First timer. Everything was explained even though I cheated and went to YouTube to check the place out in advance. Plenty of variety for meat lovers. They have a salad only option for vegetarians. Great time and very relaxed atmosphere. No complaints. Fantastic food. Creme brûlée was excellent! Amazing experience every time we go! We just love it here! Amazing service and food! The servers were prompt, informative, and very entertaining. And who could go wrong with amazing selections of all-you-can-eat meat! Fantastic food and friendly service! The garlic beef is the best!